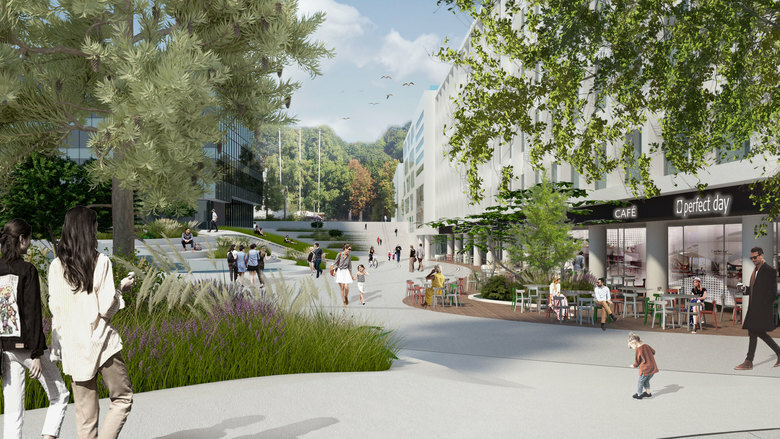 Conversion of a historically significant square in a modern urban space – In Kaunas, the second largest city of Lithuania, 3deluxe had been appointed by the Lithuanian project developer SBA to transform the central Vienybes Square and several enclosed buildings and facades. The challenge is in the transformation of the 22,000-m²-plaza to an attractive, vivid and inviting place for the public while at the same time preserving its architectural, historical and political heritage. An exciting assignment since different architectural elements like Bauhaus, Art Déco and the Soviet brutalism must be connected with the positive spirit of the young dynamic generation of Lithuania. 3deluxe realizes not only the redesign of the whole open space, but also of the facades and interior spaces of enclosed existing buildings of the 1970s influenced by the Bauhaus, while at the same time constructing a comprehensive new building complex. 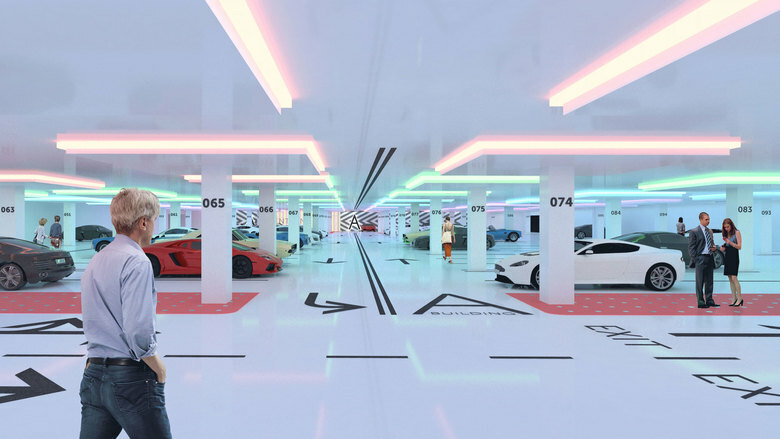 Below the square an underground parking is build. The concept is based on two overlapping and complementary creation levels structuring the square in a grid from visible floor lines. One level is linear and reproduces the historical context by adopting the grown visual and path axes. It is complemented by a second level which shows an organically fluid structure based on the study of the pedestrians’ natural stream of movement. The dynamic route lines are also visible on the entire square as curved floor joints that vividly refer to its visitors. The binary, grid-like structure forms natural “islands”. Different design elements render the square lively and perceptible for its users. 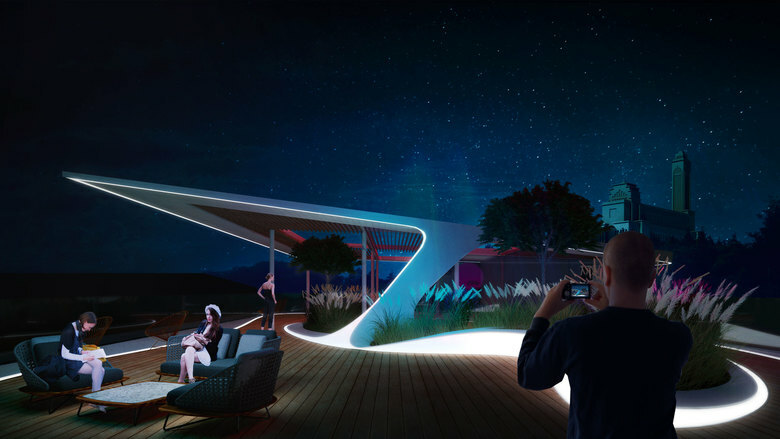 The lower section of the square contains an interactive light installation, a programmable fountain on floor level and an esthetic media installation that serves as a space for cultural and event information. 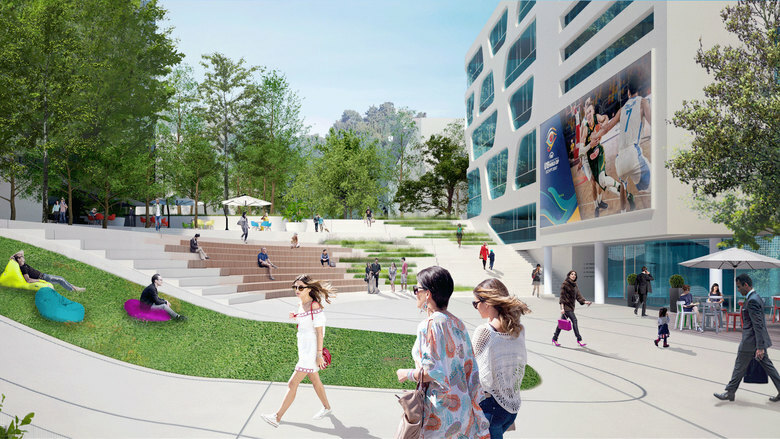 In front of the entrance areas of the university buildings that are situated on Vienybes Square, urban outdoor-furniture provides possibilities to work and communicate. 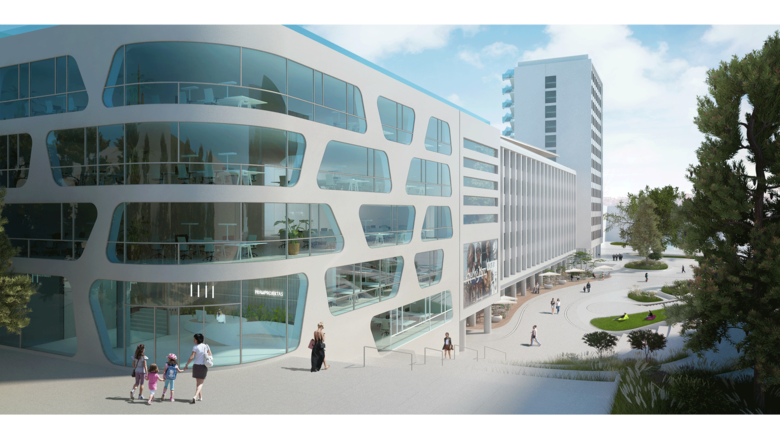 Shops, cafés and restaurants with inviting outside terraces will open on the ground floor of the redesigned existing buildings. Changing installations such as mobile kiosks, food trucks, movable seating furniture or a stage, that can be temporarily employed, also contribute to the revival of the square. An organic arrangement of newly created seat and stairway steps, gently sloping green areas and changing altitudes – laboriously modeled from three-dimensionally deformed elements of prefabricated concrete – radiates vigor and vivacity. 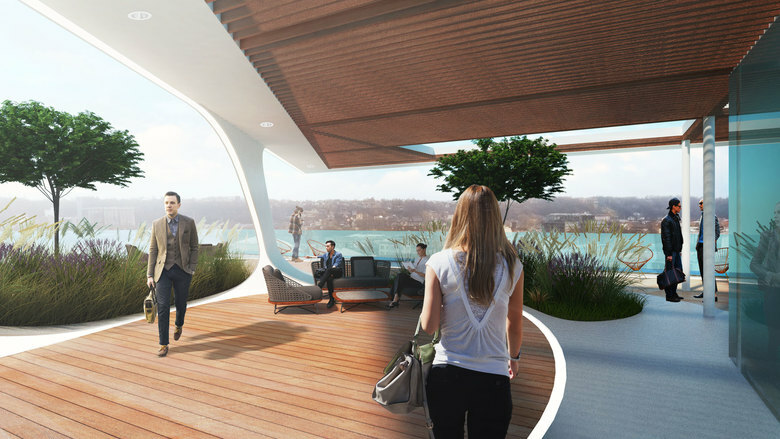 These design solutions connect different altitudes without creating offsets or blocking the view. 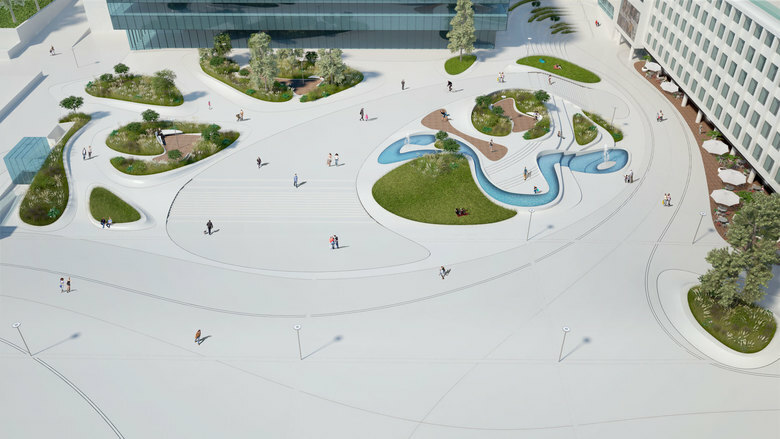 In the upper section of the square, the usable areas are organized by permanently installed furniture in different ways: as an urban refuge, a skate installation, a water playground, a sunbathing area, a basketball court or an event location. A wooden pavilion serves as a recreational retreat. As an urban gardening project it can be variably planted and offers protected seating and resting places. Vis-à-vis the newly built corner building a modern amphitheater with seating steps and green areas is created. On the opposite façade a large LED-screen for public viewing events is installed. Some of the design elements refer to the cultural heritage of Lithuania. For instance, the form of the great fountain brings to mind traditional Baltic patterns and the structure of the pavilion integrates elements of Lithuanian wooden constructions.